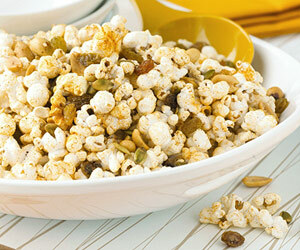 This fun snack mix is perfect for a Halloween party. It's filled with candy corn, popcorn, pretzels, corn nuts, cereal squares, and toasted pumpkin seeds. In a medium bowl, combine pumpkin seeds, oil and kosher salt; stir to coat well. Spread mixture onto a parchment paper-lined 15x10x1-inch baking pan. Let stand for 24 to 48 hours or till dry, stirring occasionally. Carefully remove paper from baking pan. Toast seeds in a 325 degree F oven for 40 to 50 minutes** or till lightly browned and crisp, stirring once or twice to brown the seeds evenly. Transfer seeds to paper towels; drain. Cool to room temperature. In a large bowl, combine toasted pumpkin seeds or sunflower seeds, popcorn, cereal, pretzel knots, candy corn and corn nuts. To store, place in a tightly covered container. Store at room temperature up to 5 days. Makes about 13 cups mix, twenty six 1/2 cup servings. * Plan on using the seeds from one large or 2 medium pumpkins for this recipe. If you don't have enough, ask your friends to share the seeds from their pumpkins with you. Remove the seeds from the pumpkins, leaving behind as much of the fiber as you can. Immediately place the seeds in a large bowl of water to avoid any fiber drying on the seeds. Transfer the pumpkin seeds to a colander. Thoroughly rinse the pumpkin seeds under cold running water, rubbing the seeds between your fingers until the pulp and strings are washed off. Drain well. Or, use purchased shelled raw pumpkin seeds. If you prefer, substitute 1-1/2 cups shelled dry-roasted sunflower seeds for the pumpkin seeds and omit toasting in the oven. ** Add an additional 10 minutes to baking time if seeds are still slightly moist.